The mediaeval Lucca festa is only in its second year but it’s certainly developing into an ever more delightful part of Lucca’s festival calendar. Although not quite on the scale of such events as Volterra (one of the best mediaeval feste in Tuscany – see my post mentioning that one at https://longoio.wordpress.com/2013/08/08/mediaeval-medley/ ) it is becoming unmissable. 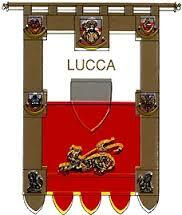 Here’s a map of the terzieri of Lucca. San Paolino is to the left, San Martino is to the right and San Salvatore is to the north. Each terziere has its own coat of arms and is divided into areas known as gonfaloni (banners) which are in turn divided into pennoni (pennants). I’ll leave you to work out the English equivalent of the Italian term. Just look at the pictures! 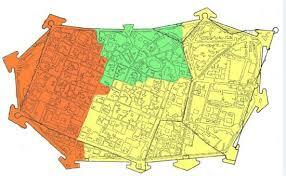 Of course, today postal codes are used – the CAP (short for Codice di Avviamento Postale) but in the medieval Lucca festa the old divisions are used. So there’s no point in asking the postman to deliver your letter to the person you know in Lucca who is living in terziere San Paolino, Gonfalone Della Sirena, pennone di San Giorgio! Lucca’s city gonfalone reflects these old divisions of the city. The city’s Festa Mediovale last week-end had all the ingredients to make it a fun day out. Birds of prey including barbagianni (barn owl) and Corvo (raven, like the ones at the Tower of London which are supposed to fly away if that city falls). A display of arms to suit all defence purposes including huge cross-bows weighing over 20 kilos. A gorgeous procession of lords, ladies and squires. I love these occasions and am so glad that Lucca has truly got into the swing of it. I’m sure next year, third time round it’ll be even bigger and better. Don’t miss it if you’re here next year! This entry was posted in Festa, Lucca by Francis. Bookmark the permalink.